2. Push the child safety lock located on the rear edge of the door to the lock ( ) position. When the child safety lock is in the lock position, the rear door will not open even when the inner door handle is pulled. 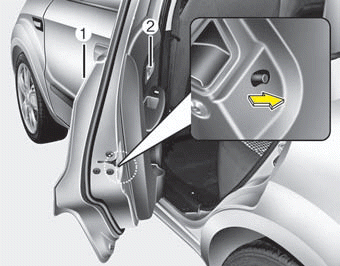 To open the rear door, pull the outside door handle (1). Use the rear door safety locks whenever children are in the vehicle. If a child accidently opens the rear doors while the vehicle is motion, he can fall out.